Many people are wondering why the McCain camp apparently leaked information hinting at Romney as his running mate if that was not the plan all along. For you puzzled LDS folks who got your hopes up, here's the secret story behind all that. The leak was a strategic move aimed at probing the response of one of the most important voter groups in modern elections: the deceased. You might be surprised to hear how important the dead vote is these days. It's something of secret due to heavily biased reporting. After all, the vast majority of reporters and editors employed in the media are living, giving rise to a heavy pro-living, anti-dead bias in their political reporting. But more and more deceased voters are turning out and playing a role that may be even more important in 2008 than it was in 2004. Romney was expected to be popular among dead voters partly because he is a member of a Church with a tremendous outreach program to the dead. The LDS and early Christian concept of "baptism for the dead" actually has significant political consequences on the other side, according to some pundits. With LDS missionary work on the other side and proxy baptisms being performed, you can imagine that the Church is well known. Actually, the LDS missionary work there looks a lot like free counseling and socializing. Even many who have no interest in the religious message enjoy the attention and occasional "love bombing" they get, though the Church certainly has its critics among the dead. Here in Wisconsin, our politicians know that they need the dead vote to win. In the last presidential election, for example, anti-dead bigots (a handful of Republicans in this case) cried fowl when Milwaukee reported 4500 more votes than there were registered voters in the 2004 election. How could there be more than 100% voter turn out in such a large city? Easy -- the officially reported registered voters excluded the dead, almost like they were non-entities. But this institutional bigotry didn't keep them from turning out to vote. The so-called "pro-living" forces called it "voter fraud" when they knew full well that they were actually seeking to disenfranchise the dead. If anyone has given their all to build up this country, it's the dead, and the least we can do is to let them vote without railing against them and spreading anti-dead bigotry. Let them vote and rest in peace. But no, the anti-dead used their political machine to drive an "anti voter fraud" bill through Wisconsin's legislature, a bill which required some allegedly minimal form of ID for voters to vote. Sounded nice in theory, but it was thinly veiled anti-dead bigotry, exploiting their natural inability to use tangible ID that the living take for granted. The anti-dead contingent cried fowl when Governor Doyle vetoed the bill. But Doyle, to his credit, remained true to his promise to make the votes of each voter count. Especially those who have already given their all (and kept giving quite a lot after death as well, thanks to probate and our high estate tax). Anyway, McCain floated the Romney idea to see what kind of lift it gave him among the dead. The lift, unfortunately, was obscured by bad polling. Instead of sampling both sides of the spirit world, paradise and that other place, lazy pollsters just surveyed the other place where the elections and polls tend to be highly rigged. The Romney balloon popped, even though he could have brought in a lot of valuable dead voters. I try to stay away from politics on this blog, especially given my profound distaste for party politics and for both major parties, but the theological aspects of the presidential campaign demand attention. What's done is done, but if McCain had gone with Romney, could the LDS angle make a difference in the 2008 election? At least for Wisconsin, the statistics are impressive: 74% of deceased Wisconsin voters surveyed said they have positive feelings about the Church for its outreach efforts to the dead. While 87% of dead prospective voters surveyed planned to vote for Obama, when asked how they would feel about a Mormon Vice President, 36% of the deceased pro-Obama forces said they would consider switching their vote to McCain. And nearly two-thirds of those willing to switch in favor a Mormon VP indicated that they would vote more than once. Finally, over 53% of the dead surveyed said they would vote for a Mormon presidential candidate regardless of party affiliation. Harry Reid, take note. To gain further insights, we interviewed one frequent deceased voter, a man who for reasons of personal privacy asked only to be identified as "Bob from Wisconsin." Bob helped settle central Wisconsin in the 1840s, and while he was apathetic about politics at the time of his death in 1868, in recent years he has become a frequent voter. He voted eight times in the 2004 presidential election. Mormanity: Bob, have you heard of the LDS Church? Bob: You bet! I'm Lutheran, but I've had the missionary discussions about thirty times over the past century and have been to some of their meetings over here. A bit different, but the people are great. Mormanity: Are you aware of LDS baptism for the dead? Bob: Aware of it? Hah! I've been baptized by them at least 16 times. I've got distant Mormon relatives all over the country now, and they keep duplicating my work, failing to check the records and see that I've already been taken care of. Way too much, if you ask me. Bob: Sure is! Every baptism means I get another little message informing me -- kind of like e-mail, you know -- about the . . . Ooops, I'm not supposed to talk about details here. Never mind. Mormanity: So you're not Lutheran, but have positive feelings about the LDS Church, apart from some redundant baptismal work -- is that right? Bob: Sure, they're about the only group among the living the really seems to treat us as more than just a name to use for occasional elections. Mormanity: So if there were a Mormon candidate, would you vote for him? Bob: I think so. All else being equal. Mormanity: What about a vice presidential candidate? Would that change things? Bob: I'm not following this campaign too closely, but it might. Bob: Don't tell me that Hillary picked Harry Reid! I'm all for Hillary, but Harry's a different story. That guy -- was he really baptized Mormon? Mormanity: No, I'm talking about Mitt Romney for the Republicans. For McCain. Bob: Whew, I didn't see that coming. Romney, eh? Well, Maybe. Might consider it. Will that be on CNN tonight? Mormanity: Maybe - at the moment it's just reliable speculation possibly leaked by insiders in the McCain campaign. Don't underestimate the impact of the dead in the election this year. Though both parties will operate under the handicap of not having a direct LDS connection, we may still hear party spokesman preparing the faithful for election day by chanting that famous old campaign motto: "bring out your dead, bring out your dead." I just hope the media (not just the mediums) will be more open about it so the dead won't feel like second-class citizens. A previous post of mine on the infancy of modern scholarship in Mesoamerica made a point regarding the lack of general knowledge about Mesoamerica among the English-speaking masses of Joseph Smith's day - a topic of possible interest to students of the Book of Mormon and its origins. It's not that many scholars were not aware of Aztec and Mayan ruins, but that the common knowledge of the day did not provide Joseph Smith with much guidance about the once great civilizations that had been on this continent. That can be debated, which is what I find interesting: not the post itself, but the robust discussion that followed, including the lectures of a most erudite scholar and poet out to awake Mormons from our mental slumber. Some challenges and questions have gone unanswered, and perhaps some of you will have further contributions to make on both sides of the discussion. Perhaps the great poet herself will arise once more? My Website analytics service for this blog shows that someone has been searching for that grand name, "RadicalFeministPoet", and coming to that old post as a result - I can only hope it's her. As much as some of her comments were a tad harsh, perhaps even vitriolic (though too supernal in tone to stir up any but the most effete mobs, fortunately), she also brought some intelligent criticism and even some generously proffered references to the table that urged some of us to read, think, and refine our position. Enduring a bit of hostility is a small price to pay for such assistance. So RadicalFeministPoet, if you're lurking, here's a wink and a hello! Look forward to hearing your latest tactful thoughts. I also hope you'll respond to Blake Ostler's interesting challenge. Another 16-year-old female classmate of my sons, the second in two years, died last night in an automobile accident. She was a bright 16-year-old girl from a religious Christian family. Witnesses reported that a car filled with kids was darting wildly between lanes as it zoomed through highway traffic at high speed. It then lost control, went across the median, and hit a van. Two kids died that night, others are seriously injured. I'm so sorry that promising young people were killed and injured unnecessarily. What a terrible loss for the families and loved ones. And what an incredible burden for the driver, who I think survived the accident. I'm quite upset by the tendency of young drivers with a car full of kids to show off by driving dangerously. Some get away with it, while others have the tragic encounter with reality that we had last night. In some cases I'm aware of, the kids getting into the car might have guessed that the driver wasn't a safe, responsible person. I hope we can help our youth have the courage to walk rather than risk their lives with a questionable driver. Alcohol is often implicated with wild driving and accidents, and I hope people of all faiths will train their children to avoid riding with someone who has been drinking (and preferably to stay away from parties where alcohol flows). When we have church activities or other events, adults and leaders might do well to consider the issue of transportation and take steps to ensure that only responsible driver will be driving our most precious cargo. The fear of injuring others should cross our minds every time we take the wheel. Can we train our young drivers to think about that rather than all the fun of joking, laughing, and showing off? Could make for some dull drivers - wouldn't that be an improvement? Both of my younger sons have recently lost a classmate in automobile accidents. The classmates came from their small classes of about 20 kids from their time at the Classical School in Appleton. The threat of unsafe driving is so great among our young people. May we help protect them and help them have the courage to say no when there is unreasonable danger. My latest "just for fun" reading, after Cornelius Van Dam's book on the Urim and Thummim, was an equally clean book, a sci-fi novel, The Disappeared by Kristine Kathryn Rusch, the first book in her Retrieval Artist series. Orson Scott Card's endorsement on the cover caught my eye - very glad I read it. Well constructed and thought-out for the most part. This interesting novel gave me two thoughts that I'd like to share today: (1) Clean fiction is still possible! and (2) great care must be exercised when dealing with cultural practices from other cultural groups that we may find offensive or even contrary to the Gospel. The Disappeared is about a future when humans interact with multiple alien cultures. In this lawyer-filled future, legal agreements between the various alien species allow alien justice to be meted out to humans when they commit transgressions on alien worlds or against aliens. Depending on the offended species, grotesque killings, enslavement, or kidnapping of the human offender's children may occur to repay humans for crimes they may not have known they were committing. Petty mistakes or innocent actions made in ignorance may be viewed as horrific crimes by the aliens, and the law leaves the guilty parties no recourse but to accept the punishment in order to keep the peace between the world. No recourse but escape, disappearing with the help of a "disappearance agency" to start a new life somewhere else under a carefully constructed new identity. Unfortunately, some of the people paying the top disappearance agency for its help are being betrayed and turned over to the aliens who are after them. A detective, Miles Flint, runs into the aftershocks of several related cases of betrayal, begins piecing things together, exposes the crooked company and takes on the unjust law in his own renegade way. Fun novel but filled with some huge gaps, like how do these disappearance agencies avoid the wrath of the aliens? One thing that impressed me right away with this novel, though, was the fact that the writer could communicate and convey stress, fear, pain, shock, and other emotions, without the puerile crutch of foul language. She could maintain interest without off-color jokes or licentious scenes. I appreciate her high standards in this book, and wish more writers (LDS writers included) would realize that there is no need for abundant profanity and lewdness. Just my two cents. The conflict between cultures reminded me of the challenges we face as the Gospel goes to all the earth, including peoples who have practices we may find appalling or sometimes contrary to Gospel principles. We must help new converts give up some cultural practices when the conflict is irreconcilable, but also be understanding and patient as new converts grow in understanding. My time working with one foreign agrarian culture in the past raised many such issues. In some cultures, it is acceptable for a young teenage girl to marry a much older man, such as a 13-year-old marrying a 20-year-old. And in the culture I have in mind, the norm is to live together for a short time. Such practices are contrary to modern Church policies, and underage marriage may result in serious legal trouble in the US. What is viewed as acceptable in one culture or in one time is a horrific crime elsewhere, or elsewhen. I have long harbored regret over how I handled a teenage marriage case among a group of immigrants years ago. I can't go into details, but there was a time when I raised my voice and was stern with a man when I probably should have been patient, gentle, and more respectful. LDS training for Church leaders teaches us to be adamant and proactive in dealing with and helping to prevent child abuse, but I may have briefly overreacted. Only a small amount, but I may have gone past a tipping point and scared someone into coverup mode. I'm not sure how much I could have changed in the long run, but it's possible that one frightened father might have found a different way to lead his family other than leaving the Church if I had been more understanding of the complex cultural currents at play. Maybe there would be fewer religious "disappeareds." I don't mean that we should ever weaken the strong policies the Church has on sexual morality, respect for the law, and preventing child abuse, but it's good to remember that things that may shock us may seem normal and acceptable to others, who may need gentle teaching and training more than they need to be scared with a fire-and-brimestone lecture and warnings about US law. Strange that a sci-fi book would bring back those painful memories. While reading a recent issue of Diabetes Forecast (background reading related to one of my favorite projects at work), I found an interesting story about a recent study linking diet soda to metabolic syndrome, a disorder related to the tragedy of diabetes. It's not clear if the diet soda is somehow causing the damage, or if those who drink diet soda have other bad behaviors or bad genes that increase the odds of metabolic trouble. But if I were you, I'd ask some serious questions about all the chemicals you dump in your body with gallons of diet soda (or regular soda, for that matter) and consider taking up water. The research also points to heavy meat consumption as being a contributing factor. The Word of Wisdom encourages us to eat meat sparingly. Maybe the next update will also include similar language about diet soda. Researchers have found a correlation between drinking diet soda and metabolic syndrome -- the collection of risk factors for cardiovascular disease and diabetes that include abdominal obesity, high cholesterol and blood glucose levels, and elevated blood pressure. Over all, a Western dietary pattern -- high intakes of refined grains, fried foods and red meat -- was associated with an 18 percent increased risk for metabolic syndrome, while a "prudent" diet dominated by fruits, vegetables, fish and poultry correlated with neither an increased nor a decreased risk. A page in Barry Bickmores' "Mormonism and Early Christianity" site provides some information from early Christian writings that are consistent with the LDS doctrine of three degrees of glory in heaven (see Doctrine and Covenants 76). I recommend reading that source to gain further insights into this distinctive doctrine. I can give you many other early Christian references to degrees of glory, but 2 Corinthians 12 ought to be sufficient. You are right that, on its face, the passage seems to be just talking about heavenly vs. earthly bodies. However, the passage also has this little enigmatic reference to "one glory of the sun, one glory of the moon, and one glory of the stars," and one star differs from another in glory. What does that mean? Most people would just skip right over it, but the early Christians seem to have placed great significance on it, taking it to mean that there are degrees of reward and punishment in heaven and hell. Whether he was actually restoring lost text, or not, Joseph Smith restored the basic meaning that early Christians attached to the passage! 8. Then there fell upon me a sleep, and I beheld a high mountain, and I was upon it. 9. And behold the heavens were opened and an angel of God said to me, Levi enter. 10. And I entered from the first heaven, and I saw there a great sea hanging. 11. And further I saw a second heaven far brighter and more brilliant, for there was a boundless light also therein. 12. And I said to the angel, Why Is this so? And the angel said to me, Marvel not at this, for thou shalt see another heaven more brilliant and incomparable. 13. And when thou hast ascended thither, Thou shalt stand near the Lord, And shalt be His minister, And shalt declare His mysteries to men, And shall proclaim concerning Him that shall redeem Israel. 14. And by thee and Judah shall the Lord appear among men saving every race of men. 15. And from the Lord's portion shall be thy life, And He shall be thy field and vineyard, And fruits, gold, and silver. 16. Hear, therefore, regarding the heavens which have been shown to thee. 17. The lowest is for this cause gloomy unto thee, in that it beholds all the unrighteous deeds of men. 18. And it has fire, snow, and ice made ready for the day of judgement, in the righteous judgement of God; for in it are all the spirits of the retributions for vengeance on men. 19. And in the second are the hosts of the armies which are ordained for the day of judgement, to work vengeance on the spirits of deceit and of Beliar. 20. And above them are the holy ones. 21. And in the highest of all dwelleth the Great Glory, far above all holiness. 23. Offering to the Lord a sweet-smelling savour, a reasonable and a bloodless offering. 24. And [in the heaven below this] are the angels who bear answers to the angels of the presence of the Lord. 25. And in the heaven next to this are thrones and dominions, in which always they offer praise to God. No, that proves nothing, but there are at least reasons to accept the LDS interpretation of 1 Cor. 15:40-42 as being reasonable enough to be shared by early Christians. So, I find it interesting. Many thanks to Barry Bickmore, once again. 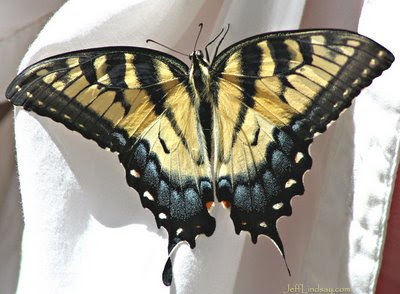 After visiting the massive farmers' market in downtown Madison, Wisconsin two weeks ago, my family ran into a woman on a sidewalk who was holding extremely still, looking at a beautiful swallowtail butterfly on her clothing. The butterfly had just barely emerged from a cocoon between some bricks on a building, and had managed to fly only a few inches before landing on her. 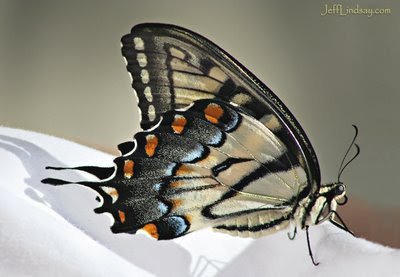 This beautiful "born again" creature was drying off its new wings and preparing to take flight. Soon it would be soaring above the trees, but at the moment it was completely helpless, dependent on the mercy of its protector. The woman kindly allowed me to take some photos, shown above, and several others joined us to admire this delicate and gorgeous creature. It tried to fly again but only went a few more inches before landing on another part of her clothing. After several minutes, it gathered its strength and launched into the air, and we cheered as it flew up into the sky and disappeared into the upper branches of a tall tree. As I pondered the successful emergence of the butterfly from the cocoon into the freedom of flight, I remembered how delicate we all are at various stages of our lives. This is especially true for those who are newly born again as freshly baptized members of the Church just beginning to recognize the power of the wings of the Spirit that can guide our flight through the challenges and dangers of life. For newborn converts, there are many who lie in wait to ambush their faith with hostile literature and slander, belittling a religion that has long been "spoken against everywhere" (Acts 28:22). Without some protection and loving help, the attacks of others can lead delicate converts away and make quick prey of them. We all may need nurturing and protection from kindly hands, often unappreciated at the time, who watch over us and shelter us in our most vulnerable times. For some, it may be a home teacher or bishop, a parent, a friend, or a mission president. Rarely can we succeed on our own without the help of other mortals in addition, of course, to the help and influence of the Savior. Many thanks to that kindly woman in Madison for her example of care. Jesus Alone - No Need for a Church? Many people do not understand why a Church of Jesus Christ is needed - isn't Jesus along all we need? Why do we need leaders like apostles and prophets? Why do we need an organization at all? All fair questions. After stating that we have access to the Father through Christ, note that Paul immediately turns to the theme of the community that is found within the Church. In following Christ, we are not meant to be alone, not meant to be strangers, but are part of the saints, fellow citizens with other people seeking the holy things of God, members of the household of God. A household is like a family. Family members need each other for strength, for support, for nourishment, for healing, for teaching, and for protection. Just as loving parents don't throw newborns into the wild and wish them luck but expect to spend years nourishing and teaching them, so also our new converts, those who are newly born again, still need much nourishment and gentle teaching and support to become grounded and strong on their own. And all of us need the strength and support of others, or the opportunity to serve others. Whether serving or being served, this interaction in the household of God is how we grow, how we develop charity, and how we better fulfill our divine destiny as children of God. We can't do it alone. We can't fully be who we are meant to be by living as hermits. After introducing the theme of community and the household of God, Paul then tells us that we are built upon a foundation with Jesus Christ as the chief corner stone - but not the only stone. The foundation on which we must build, on which the Church of Jesus Christ is built, also includes His authorized servants who receive revelation from Him. Thus, the foundation of the Church includes apostles and prophets, who provide leadership and teachings from Jesus Christ. This foundation helps create the setting where we can have the fellowship needed and participate in the household of God. As we work together in this household, being based on foundation of Christ, His Atonement and His revelations and ongoing guidance through apostles and prophets, we experience growth and progress in the Gospel. We find that the Spirit can be more fully in our lives and in our community, and that what we are building becomes like the temple - a holy place where we can prepare for fellowship with God. Our eternal destiny is not about being immortal hermits, but part of a glorious community with God as our Heavenly Father. We need the Church in our lives to prepare for that now and enjoy the blessings of guidance, mutual service, self-sacrifice, and fellowship that the Church gives us. 11 And He Himself gave some to be apostles, some prophets, some evangelists, and some pastors and teachers, 12 for the equipping of the saints for the work of ministry, for the edifying of the body of Christ, 13 till we all come to the unity of the faith and of the knowledge of the Son of God, to a perfect man, to the measure of the stature of the fullness of Christ; 14 that we should no longer be children, tossed to and fro and carried about with every wind of doctrine, by the trickery of men, in the cunning craftiness of deceitful plotting, 15 but, speaking the truth in love, may grow up in all things into Him who is the head—Christ-- 16 from whom the whole body, joined and knit together by what every joint supplies, according to the effective working by which every part does its share, causes growth of the body for the edifying of itself in love. Paul teaches that we need these different offices, including leaders such as apostles and prophets, to guide the Church until there is a unity of faith, something most definitely absent in the world. These offices are needed more than ever! He also discusses the need for us to grow up through the influence of the Church and become the perfected person the Lord wants us to be. This growth process requires the kind of cooperation of parts that we see in the human body, again signifying the harmony and cooperation that we should strive for in the household of God. It's something we can't do alone. We need each other, and we need the various offices the Lord put into his Church anciently, and has restored in modern times. How greateful I am for the Restoration of the Church of Jesus Christ. In spite of our warts and weaknesses, the Church provides a wonderful tool to bless our lives in some many ways, and a tool for us to learn to bless the lives of others as well. It's a divine instrument that we all need, no matter how much we flatter ourselves thinking that we can do it alone, that all we need is Jesus - but do we really accept Jesus if we reject the organization He brought and the leaders He has sent to teach and guide the household of faith? To say that one doesn't need the Church of Jesus Christ, with its apostles and prophets, because all one needs is Jesus, is like a saying that one doesn't need the Bible and the teachings of its prophets and apostles for the same reason. It completely misses the point of what the Lord is trying to help us do and who He is trying to help us become, if we'll let Him. The scriptures and the Church are there to bless us. May we not think we are self-sufficient and reject what the Lord offers us. 14. yea if he say unto the earth thou shalt go back that it lengthen out the day for many hours and it is done. 16. and behold also if he saith unto the waters of the great deep be thou dried up and it is done. 17. behold if he saith unto this mountain be thou raised up and come over and fall upon that city that it be buried up and behold it is done. 19. and if the Lord shall say be thou accursed that no man shall find thee from this time henceforth and forever and behold no man getteth it henceforth and forever. 20. and behold if the Lord shall say unto a man because of thine iniquities thou shalt be accursed forever and it shall be done. It is difficult to imagine a native speaker of English (such as Joseph Smith, though poorly educated at the time, indisputably was) producing such sentences. Yet they represent perfectly acceptable Hebrew. Difficult indeed! So, this compelling evidence of Hebraic origins has been carefully covered up in modern printings to make the grammar more acceptable! (Fortunately, some of the other tell-tale Semitic evidence has been allowed to stay.) What are they trying to hide? Well, stew upon that for a while, dear Mormons. I haven't even brought up the part about the change to cover up Moroni waving the "rent" of his garment in the air, as Hebrews were wont to do (i.e., it's a logical expression in Hebrew, awkward in English), so it had to be covered up for the sensitivities of modern English readers with an emendation to the text. Now Moroni waves the "rent part" of his garment. All in the name of grammar! Dr. Cornelis Van Dam of the Theological College of the Canadian Reformed Churches has written a fascinating book on a generally neglected topic of Biblical scholarship: the Urim and Thummim. His book, The Urim and Thummim: A Means of Revelation in Ancient Israel (Winona Lake, Indiana: Eisenbrauns, 1997) was the first major work on this topic in many years and represents a major advance in scholarship. Now, this handsome hardbound book of nearly 300 pages is available for next to nothing during an incredible August sale at Eisenbrauns. The list price is $42.50, but the sale price is only $8.50. I don't normally endorse commercial services here, but I will point out that I received a boxful of amazing books on biblical and Near Eastern scholarship for the normal price of one or two books of this genre. So why are you waiting?? Thanks to Mike Parker for the alert on this sale. Several LDS folks have already reviewed or mentioned Van Dam's brilliant tome. The most detail is in Kerry Shirts' review. FARMS discusses a few parts of Van Dam's work in "Teraphim and the Urim and Thummim" by Matthew Roper. I'll share a couple highlights I've picked up so far. Van Dam begins by noting that scholarship on the Urim and Thummim had become rather silent since a sort of consensus had been reached that the Urim and Thummim was probably lots (e.g., systems such as two or more sticks that could be randomly selected to reveal a yes/no answer), which I notice is the primary view advocated in the Wikipedia entry on Urim and Thummim. Surprisingly, Van Dam is not even cited on Wikipedia (as viewed Aug. 9, 2008). Van Dam humbly observes that there is yet more to add to the discussions of the past, and then offers a mountain of new insights about this mysterious device used by ancient priests in Israel. He begins with a survey of past commentary and scholarship, which tends to argue that the device was primarily allegorical or symbolic, not a means of revelation. From medieval days on, "the preponderance of allegorical exposition meant that there was often very little attention given to the exact (physical) identity of the UT" (p. 12). Though allegorical interpretations of scripture generally fell out of favor with the Reformation, the Urim and Thummim continued to be viewed largely as symbolic. "Between the seventeenth and the twentieth centuries, a significant number of scholar continued to regard the UT, not as a specific means of revelation, but as a symbol. Usually the UT were considered symbolic of the presence of God and/or the illumination and veracity of the revelation (which was considered to have been given through inspiration to the high priest)" (p. 14). Some sources, though, treated the Urim and Thummim as real physical objects. A very old tradition equated it with stones on the breastplate or ephod of ancient Israelite priests. Van Dam observes, however, that an "obvious advantage of considering the UT to be one or two gems that were distinguished from the breastpiece is that justice is done to the differentiation made between the two in Exod 28:30 and Lev 8:8" (p. 29). Van Dam states that this is a reference to "the flashing of the two engraved stones on the shoulderpieces of the ephod of the high priest" (p. 17). Some writers between the seveneteenth and nineteenth centuries held that the Urim and Thummim were the twelve gems on the breastplate of the priest, and that prophetic inspiration was the mode of revelation. Van Dam ably argues against the lot theory, advocating instead that the Urim and Thummim was associated with prophecy and revelation more generally, not merely using lots to get yes/no answers or to choose between two or more possibilities. If he is correct, "then we are bringing together two elements that generally have been carefully separated in biblical scholarship, namely, priesthood and prophecy. This separation, begun in the early nineteenth century, has been characteristic of the last hundred years or so, precisely when the lot theory was in vogue." Van Dam discusses traditions in the Babylonian Talmud in which revelation was received through the Urim and Thummim (here identified with the gems of the high-priestly breastpiece) via letters engraved on the stones. "One tradition thought the letters that formed the reply stood out while the priest presumably made up the right combination, whereas the other argued that the letters combined for form the words of the response" (p. 20). [W]hen the priest fixed his thoughts on the divine names in the Urim, some letters engraved upon the stones of the breastpiece would light up before the eyes of the priest who inquired of their judgment. Not yet knowing he correct arrangement of the letters to form the response, the priest would fix his thought on the divine names in the Thummim, and his heart was made perfect so that he could understand the meaning of the letters that had lit up. This sounds somewhat similar to Doctrine and Covenants Section 9, where we learn that the divine gift of translating the Book of Mormon required more than simply looking into the Urim and Thummim, but serious mental effort to understand, receiving revelation through heart and mind. And of course, this process required the mortal to be pure and close to God. Van Dam makes particular note of the associations of the Urim and Thummim with light (e.g., pp. 132-139), noting that the words may well mean something like "light and perfection" or even "perfect light" (p. 224). Various ancient sources refer to light emanating from the Urim and Thummim as playing a key role in the revelatory process. Van Dam finds evidence suggesting the theory (admittedly speculative, according to Van Dam) that the Urim and Thummim might have been a gemstone (pp. 224-226), perhaps just a single object, though it may have been more than one object. Recognizing the strong associations between the Urim and Thummim and revelatory light and truth, Van Dam suggests that some biblical passages that mention light and truth may implicitly be references to the Urim and Thummim (pp. 225-226). He also points that the rise of rationalism since the 17th century led to the falling out of favor of the theory that supernatural light was involved in its use. Van Dam's exposition will be of interest to students of LDS religion, for Joseph Smith's references to the Urim and Thummim are strongly supported by scholarship on the ancient understanding of these tools. Joseph Smith taught that these were divine tools which provided light that allowed one to see things as part of the revelatory experience. The Urim and Thummim could help him translate text, receive revelations and answers to questions. It involved a stone or stones which could provide revelatory light. And references in the LDS scriptures to seer stones, Gazelem, the glowing stones in Ether 3, and the Urim and Thummim that the saints will receive in the Celestial Kingdom all appear to fit surprisingly well in the context of modern scholarship about ancient biblical views on the mysterious Urim and Thummim. Not bad for young Joseph Smith if he were making all this up at a time when it would have been safer to not mention the Urim and Thummim at all or treat them as allegorical. But, yes, he could have theoretically obtained information from several sources suggesting that they were stones or jewels. One source is Josephus. There was also a sermon given in New York in 1800 by John Stafford on the Urim and Thummim teaching that they were two jewels (you can read this at Google Books: "The Urim and Thummim," delivered before Hiram Lodge, No. 72, Dec. 27, 1800, New York: E. Conrad, 1820. There is much more to say on this topic, but that will suffice for now. I hope you'll read the book yourself. During two years in the fabulous the Zürich Switzerland mission, I had the privilege of working with a huge variety of people. I counted 52 different nationalities of people that we taught in that international melting pot. We taught people from all social ranks, and while the poor and humble were the easiest to teach, we found the highly educated and wealthy to be far more receptive and warm to us than I would have imagined. The Swiss are a friendly people - though I'll admit this was back before American became a hiss and a byword among many nations that once respected this nation. We had relatively little success among the intellectuals that we met, but I greatly value the opportunities we had to talk. They gave us plenty to think about, and we certainly tried to make it mutual, young and naive as we were. I remember one intellectual being very upset with us. In nearly perfect English, he chastised us for thinking we had testimonies. He explained that he was familiar with our faith and had attended our meetings while he was in the US, and was amazed at how little children in fast and testimony meetings would go up and parrot words their parents gave them, as if that was a testimony. He became angry and said that we had been brainwashed and couldn't think for ourselves. His unkind critique stuck with me and influenced the way I instructed my ward about testimony meetings back when I was serving as a bishop. While some young children can have sincere testimonies about some aspects of the Gospel, I want people to express testimonies from their hearts and not to simply parrot the words of others. Personally, I had a genuine strong but fledgling testimony of God and the power of prayer at age 6, though I don't think I publicly expressed it until I was a teenager, and my testimony of the Book of Mormon did not really begin until I earnestly sought to determine its divinity or fraudulence at age 14. There was some merit to his criticism, but much of it was a caricature of the LDS testimony, especially the testimonies of those who have sincerely sought to know for themselves of the reality of Jesus Christ as our Savior, the truthfulness of the message of the Restored Gospel of Jesus Christ, etc. In spite of the appearance of some children just parroting other people's words in some units, the typical faithful Latter-day Saint has done a lot of soul-searching, studying, and prayer, just as the Book of Mormon teaches us (e.g., the story of Enos and his quest for a testimony, the many references to long study, prayer, and fasting to obtain personal knowledge, and the promise of Moroni 10:3-4 to those who study, ponder, and pray to know of the truth of the Book of Mormon). The LDS testimony is based upon a combination of mental effort such as studying and pondering, coupled with spiritual effort through prayer and listening to the Spirit, in a quest to receive revelation from the Spirit of God to our own spirit to help us understand the things of God. Unfortunately, the critics of our faith make a mockery of this thing that we call our testimony. This personal, private experience with revelation from God is ridiculed as a mindless reliance on "feelings" alone, perhaps mistaking a touch of heartburn or warm humid air for the revelation from God. In the anti-Mormon caricature of the LDS testimony, logic, evidence, and facts have no bearing on our belief, just warm feelings we get during meetings with suspiciously poor air conditioning (preferably just after partaking of the sacrament featuring Uncle Garcia's Jalapeño Bread - "producing spiritual experiences since 1965"). Some of our critics bemoan our benighted state of ignorance, insisting that our so-called testimonies represent mindless blindness, unlike the evidence-based belief system of Evangelical Christianity. Here at Mormanity a number of critics have told us how foolish it is to pray to know the truth, which is a sure path for deception. Instead, real Christians simply have to look at the clear evidence God has given us and accept the facts - no need to pray and seek subjective "revelation" since God has already revealed plain facts in black and white. It gets very interesting when you press for details and ask which facts, and how to interpret them, and why there are so many different teachings if all truth is so clearcut. The so-called evidence for things like the truthfulness of Genesis become an occasional ancient document mentioning some ancient city also mentioned in the Bible, or some find possibly affirming that there was a king named David. The evidence for things like the Atonement and Resurrection of Jesus Christ and the miracles he performed become little more than assertions of a much copied and edited document that is long removed from the time of those events, with absolutely no original New Testament manuscript known for any part of the New Testament. I believe in the Bible, but to say that no faith is needed to accept Jesus as the Christ because of the irrefutable evidence is ludicrous - and anti-Biblical. There are witnesses for Christ, as there are witnesses for the Book of Mormon, which itself is a witness of Christ. God has not left us without witnesses and evidence, but the impact of these is greatest after faith is exerted. There are evidences for the Bible and for the Book of Mormon, as there are for the role of Joseph Smith as prophet. Conversion involves the brain, but not the brain alone. The role of faith and revelation through the Spirit must not be overlooked. It is essential. I am offended by the anti-Mormon caricature of the LDS testimony as based upon feelings alone. It is heart and mind turning toward the Lord, studying, pondering, seeking, and then receiving revelation and enlightenment to the heart and to the mind. A testimony of Jesus Christ is not the result of intellectually overwhelming evidence based on tangible data - the witness of "flesh and blood" - but on the revelation from God through the Spirit to our spirits. This may all sound like heresy to some who think that the LDS concept of personal revelation is an affront to the plain, evidence-based, logical truth that they think they have. But these concepts are purely biblical and purely Christian. 4 And my speech and my preaching were not with persuasive words of human wisdom, but in demonstration of the Spirit and of power, 5 that your faith should not be in the wisdom of men but in the power of God. 13 These things we also speak, not in words which man's wisdom teaches but which the Holy Spirit teaches, comparing spiritual things with spiritual. 14 But the natural man does not receive the things of the Spirit of God, for they are foolishness to him; nor can he know them, because they are spiritually discerned. Don't expect the evidence - as impressive as it can be to those who have the eye of faith - to convert the natural man, the man who insists on evidence and logic and proof. Faith is needed, and prayer is truly helpful, as James teaches (James 1:5). The goal, of course, is to receive personal revelation through the Spirit to help us know and understand the truth of God that is hidden from the wisdom of men. We call that a testimony. It's a valid biblical concept, in spite of the hostile caricatures of our our critics, and in spite of the weaknesses of some LDS testimonies and testimony sharing. I first heard about the results of the very successful Appleton Stake Youth Conference tonight from a young person in our ward who was just about bouncing off the ceiling from excitement about what a great conference it was. And then I heard an hour's worth of great stories and experiences from my 16-year-old son, who was involved in planning and running the event. I'm so grateful to the youth leaders who made this happen - three and half days of great activities, fun, and faith-promoting experiences at a remote Wisconsin site. Very worthwhile. And they even had healthy food, like salad bars with great veggies. One of the highlights my son told me about was the session with James Fullmer, an amazing artist and creator of the games at Book of Mormon Battles (BookOfMormonBattles.com). I don't know much of what he did yet, but the youth loved it. My son did tell me that he showed them an example of the Mesoamerican sword (macahuitl) that may be the kind of sword that we read about in, say, the Book of Alma. I also heard about some fun battles with their own foam-based macahuitls. They had something of a simulated Book of Mormon battle scene, with the surprise twist that the group with my son in it acted like the converted Anti-Nephi-Lehites who buried their weapons and refused to kill any more. The other party didn't know this and was surprised to encounter no resistance. Unlike the attacking Lamanites in the Book of Mormon, though, the Wisconsinite band was a little more hard-hearted and wiped out all of the converts. Well, some moments are more faith promoting than others. Oh, did I mention they had a couple of dances? The second dance was awesome, and my son learned the power of Altoids. Open a case of popular Altoids, and females gather. An important tip for you young men -- remember, you heard it here at Mormanity.org. Lots of fun, great instruction, great speakers, and great activities, with no major injuries that I can detect. What more could parents ask for? Youth conferences seem to get a lot of attention from adult leaders as key events to help strengthen the youth. I'm so pleased that youth leaders and Stake leaders work so hard to bless the lives of our young people. Thanks! Having just learned that the Maxwell Institute (FARMS) has revised their Website so that most previous links to PDF files no longer work (ouch - but I'm genuinely relieved it's only PDF files this time), I've begin the process of fixing my numerous links to those files. One of the first I dug up again is one that I should share here as well: Volcanic Destruction in the Book of Mormon: Possible Evidence from Ice Cores by Benjamin Jordan. (One of the many shreds that have surely been carefully considered by those who shout that there isn't a shred of evidence in favor of anything the Book of Mormon.) Coupled with additional data on volcanic activity consistent with the description in Third Nephi, it's an interesting avenue to ponder. Wisconsin is the nation's #1 state when it comes to drinking, at least based on some metrics. You can explore stats for all the states and see how your state compares on the "The State of Drinking" Website, a valuable resource created by Wisconsin Gannett Media (owners of my local paper, the Post-Crescent). It also provides compelling stories about the lives of people affected by alcohol.